Learn about our values, mission, and purpose. Discover ways to get involved at FBC and be a beacon for outreach to our community. A new church, especially a large one can feel overwhelming. It is our goal to help you know what to expect and feel comfortable as soon as you arrive. We have a team of friendly faces ready to greet and guide you and/or your family during your first experience at First Baptist. Join us for a Worship Service! Each service is comprised of a combination of music, teaching, and prayer lasting around 70 minutes. Our Senior Pastor, Kenneth Lance preaches the majority of our services. Regardless of who preaches, the sermon is based on the same Bible verses for both services. Made up of traditional music and utilizes the hymnbook, organ, piano, and choir. This is typically a much smaller service. Please remember there is no child care services during the 8:30 worship service. Uses the best biblically and theologically rich modern praise music and the familiar traditional hymns. Piano and our praise band, choir and praise team are help lead in worship. We project the lyrics to aid in singing and videos and other technology are often woven in the service to enhance the flow of our worship and compliment the message. 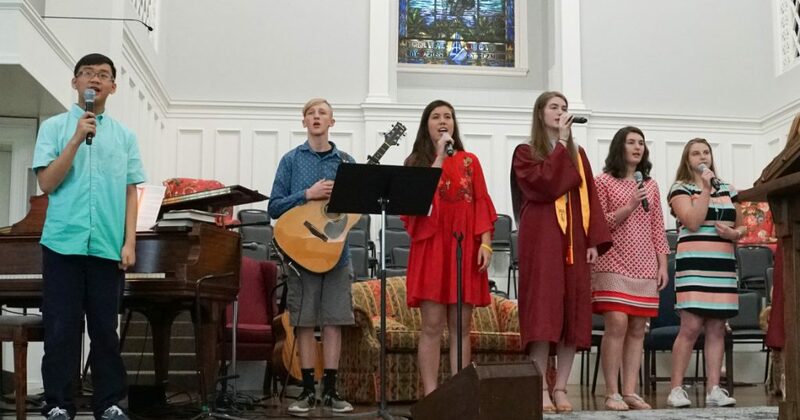 Sunday morning worship services at First Baptist-Salisbury are open to all regardless of age, gender, religious belief, disability, handicap, race or ethnicity. You're free to sit in any available seat on the main floor or in the balcony. If the service has already begun and you need assistance finding a seat, an usher will help guide you. Dress comfortably. We want you to be at ease. Most of our attendees wear smart casual, but we cover the spectrum. No matter what you wear, you won’t be alone. Children are an important part of First Baptist. We provide quality care in a secure environment, where sharing the love of Jesus is our main objective. During our 11am service, classes are available for children from birth – Kindergarten. Classes for all ages start at 9:45. Email angela@fbcsalisbury.org with questions or ask any of our friendly volunteers to direct you to our preschool and FirstKids area to safely check-in your child/ren. We look forward to your visit! We have a special team (Access Ministry) that serves you and your special needs child/adult so you know you are welcomed and loved. We'll work with you to provide the appropriate level of assistance needed for that person so they can learn about Jesus in a loving and safe environment while you attend Bible study. Before your visit you’re your special needs child/adult please contact Mary Ann Cody or Jtan Whisenant at ejcody@carolina.rr.com or djwhisenant@fibrant.com for more information. We offer solid, practical biblical studies in an engaging atmosphere for middle school students at 9:45. Middle school and high school students meet in separate groups in the First Ministry Center across the street from the Main Sanctuary. Once you enter the building the Youth Ministry area is immediately to your right. We offer Separate fellowship and bible studies for singles who are younger or more mature at 9:45 in the FMC. First offers on-site parking for our services and special parking with those with physical challenges. A limited number of spaces are available on Fulton Street in front of the church. Additional spaces can be found in the parking lot that adjoins the First Ministry Center, and the lot behind the sanctuary that you can access from either Lee St. or Council St. A limited number of Guest parking spaces are also available on Fulton St. in front on the sanctuary. Plan on arriving 10 minutes before your desired service if you plan on checking your children into childcare or a class. We offer several locations in our sanctuary for wheelchairs and for those needing additional space. Please see one of our ushers for assistance or stop by the Information Desk in the Main Lobby of the sanctuary for help. Handicap parking is available at the main entrance in front of Fulton Street as well as spaces behind the sanctuary that you can access via Council Street or Lee Street. If you have any questions about our church, please send us a message below and we will be in contact with you. My mission as pastor is to encourage, empower and equip fellow believers to fulfill God's mission through His church, through the proclamation of God's word and being a shepherd of His flock, seeking God's heart and casting His vision for the future of this faith family..
© 2018 FBC Salisbury. All Rights Reserved. North American Mission Board emphasis. The need for hope is the great equalizer. God commands you to be the conduit of hope to your family, to your community. Time is an important commodity. The time to take God seriously is now. Dismissing God is like a bush in the desert. The bush doesn't realize it's thirsty. but it's dying because it's not connected to the source.